In 2014, AdrenalinBASE DESIGNED THE SOFT BARS SYSTEM ON ITS NEW DIRECT HARNESS TO IMPROVE SAFETY DURING PARACHUTE OPENINGS. The innovation lies in the connection dorsal webbing / main lift webbing. For over 20 years direct harnesses were built in the same way. Practices changing, in very rare circumstances this assembly can be pushed to its limit and deteriorate. 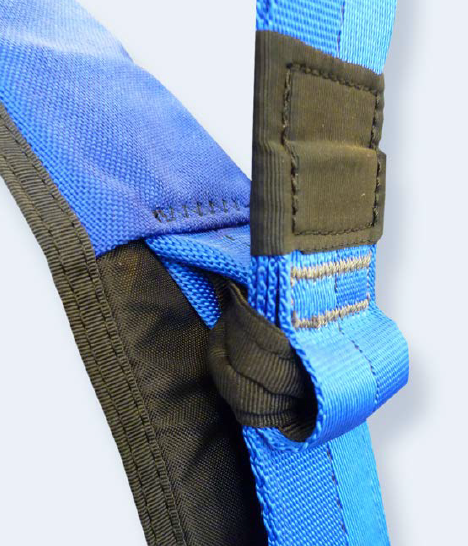 These new SOFT BARS are used to connect the back strap to the main harness strap without risk of tearing, providing the maximum security level. Our SOFT BARS are flexible, compactand working correctly at all angles. The tests show a 4 times more elevated resistance than current connections, the limit of our new connection is around 1600 daN. These soft connections have the same type of assembly than L Bars, but they are not removable. They can be only installed during the construction of the harness and they do not require maintenance in particular. For standard Direct harness assembly, keep in mind that the present sewing does not require a replacement, but simply a regularly control, like all of your equipment in general. They have been used successfully on all our Direct harnesses for years. OUR INTEGRITY/DIRECT HARNESS ARE ALL EQUIPPED WITH SOFT BARS SYSTEM.